The ork horde moves forward, eager to reach the Space Marines. This fight wasn’t going well, Grox thought. First the Weird Boy went down, then the Tankbustas. When the humies had dropped out of the sky and landed behind his left flank, the warboss was thrilled, thinking his Boyz would finally get a chance to smash some humies. But these armored humies were tough. They’d waded into his Boyz, and when the fighting was done, every ork was down … and only one humie. The remaining four humies were advancing. Looking behind him, Grox saw that his Grots weren’t going to be any help. Instead of heading toward the humies, they were running the other way. After the fight, they’d no doubt claim they were guarding the rear or claiming some “objective,” whatever that meant. Well, he still had a sizable mob of Boyz, he thought, and the ‘Ard Boyz were screaming for blood. So there was still a lot of fight in the lads. Grox bellowed at his Boyz, ordering them to follow him around a clump of mesas that divided the battlefield in half. The humies weren’t the only ones who knew “taktiks.” He intended to use the mesas to screen his Boyz from some of the humie fire as they approached. At least, that was the plan. But everything quickly went wrong. As he neared the last mesa, a humie tank came roaring around the corner and plowed into his mob. Most of the lads were able to get out of the way, but about half a dozen were too slow—and disappeared under the tank’s treads. Grox was almost one of them. He managed to sidestep the tank, but instead of roaring past, it came to a sudden stop, its bulk blocking his path to the humie line. “That’s cheat’n!” Grox yelled in outrage. He hefted his battle axe and slammed it into the tank, only to have the heavy blade bounce off the vehicle’s thick armor. “Go around!” he ordered, then started to feel the sting of slugga rounds as his Boyz fired instinctively at the tank and the shots ricocheted back into the ork mob. To his left, the five Astartes of Squad Mikos withdrew a dozen paces, refusing the left flank and redeploying to a new firing line. To his right, Squad Marcus took up position behind the Razorback, at an angle that would put the temporarily delayed orks into a crossfire. The first orks to run past the Razorback were the heavily armored greenskins—the ‘Ard Boyz—and they let out a roar as they spotted Squad Mikos and charged. With a belch of black smoke, the engine of the Razorback roared, and the armored transport jerked forward. As a gap appeared between the transport and mesa, the other mob of orks predictably rushed through the gap and forward into the fire of Squad Marcus. Now for the killing blow, Galen thought. He ordered his marines to fire—and then charge. The orks finally make contact with the Knights of Altair. The melee did not go as the greenskins intended. Indeed, the orks were slaughtered … without a single Knight harmed. “Kill ‘em! Kill ‘em!” At this point, Grox could do little but bellow in frustration. Half of his Boyz had just fallen to the humie fire, and this close to the enemy, there was nothing left to do but charge in. The warboss succumbed to instinct, raising his axe and roaring as he ran forward. He ran right at one of the humies, who himself charged at Grox. The ork swung his axe, only to find the humie’s head was no longer where he’d aimed. As he realized this, the teeth of the humie’s chainsword sank into his gut and severed his spine. Grox fell heavily, barely registering the pain of the chainsword pulling out of his stomach and leaving his guts free to spill onto the ground. The huge ork had just enough time to feel outraged that his legs no longer worked when the chainsword sank into the back of his skull and eviscerated his tiny brain. The battle was over, and Galen surveyed the scene with cold detachment. The ground was littered with ork bodies, and his warriors were checking the xenos to dispatch any that still breathed. In the distance, he could make out the only remaining greenskins alive—the diminutive Grots that were disappearing into some nearby woods. “Casualty reports,” he ordered over his com link. The response pleased him. Except for the unlucky scout killed by the ork psyker early in the battle, the only other casualty was a Vanguard veteran who’d fallen in the first melee of the battle. With a thought to his neural link, he switched to the command channel on his vox and sent a brief message to Captain Nevarre. TheGM: I am a bit of a wimp. This was my first fight with my Space Marines facing TheGaffer’s orks, so I cringed when I watched the ork horde advance. (Very unSpace Marine-like.) I was keenly aware of the small number of Space Marines on the table—and the awesome potential of the orks in melee. So my first reaction was that of a commander of squishy Imperial Guard. I focused on my firing—and falling back. But I’d underestimated the Veterans’ abilities. They not only weathered the ork charge but, in the next round of melee, they defeated the orks and ran them down. So, halfway through the fight, the ork left flank was crushed. I was about to withdraw on the right flank and force the orks to run the gauntlet of Space Marine fire, but TheGaffer saw the writing on the wall and suggested that, as the battle was likely decided, why not see what the Space Marines can really do? So, I agreed to go toe-to-toe with the greenskins. I started with a tank shock to disrupt their advance, and after whittling them down with fire (and repulsed one ork charge), my Knights of Altair charged—and the orks went down. 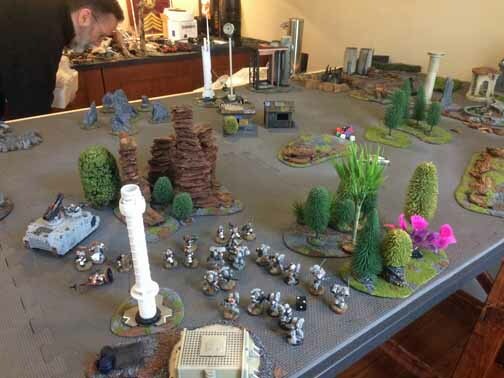 As this was a small fight (500 points), and I wasn’t ready to commit to an “official” campaign game in my first outing with Space Marines (not counting solo practice games), this battle was “for fun” and will only count as part of the “history” of the Hegira campaign. Still, I can’t say I’m not happy with the way history played out. Our battlefield was very rural–mostly trees and rocks. That slightly out-of-focus Grot in the background is a rare view of TheGaffer. Imperial: Line breaker (1 VP), First Blood (1 VP), Kill the Warlord (1 VP),and 2 objectives worth 6 VP. Orks: 1 objective worth 2 VP. Click here to return to Part 1 of the battle. The Corvus Cluster is a Warhammer 40K blog documenting our wargaming adventures in the fantastical sci-fi universe of Games Workshop.